Our communities are beautifully maintained, with professional on-site management to take care of all your needs. We take pride in our buildings, so you can be proud to call them home. Each community is unique, with amenities to enhance your lifestyle. Some feature fitness centers, others have resort-style pools and community barbecue areas, while others boast on-site access to mass transit. Choose from our collection of ten communities in the best locations throughout Hollywood. With a great choice of floor plans and amenities, and professional and courteous management, you’ll find a place that feels like home. Many of our buildings feature newly renovated kitchens and baths with updated appliances. Choose from studios, one bedroom, two bedrooms, and three bedroom apartments. Check out our gallery to see photos of all our properties. Ask about our monthly specials to make your next move even more affordable! 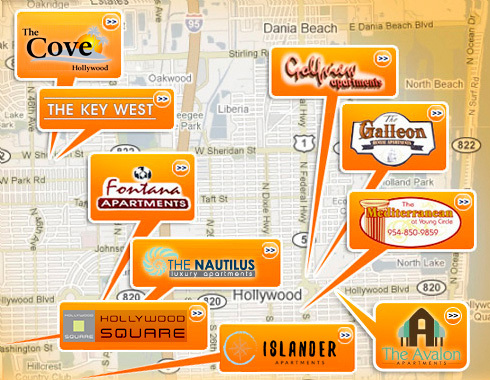 We are your source for all the best deals on apartments in Hollywood, Florida. With apartment complexes throughout Hollywood we offer renters a home with the ideal location and optimum convenience. Our extensive collection of apartments range from affordable studios to luxurious three-bedroom newly constructed penthouse units. All of our properties are professionally managed and well maintained to ensure that you have an enjoyable living experience at the lowest prices available. Let us help you find your next home. We also offer our professional marketing and property management services to other Hollywood apartment building owners. Contact us to find out more about how your building could be part of the Rent Hollywood collection.